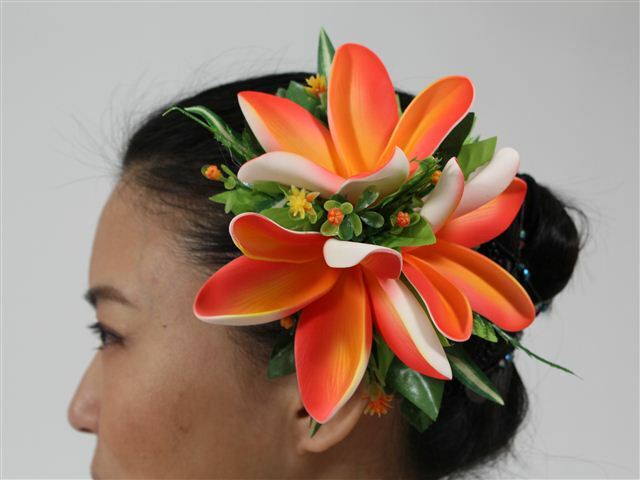 This high quality hair clip is mainly used by Hawaii's finest Hula Halaus for their high performance stage. They are all hand crafted with original designs and made in Hawai'i. Length of a clip: 4.75"
Most flowers are made of foam and/or latex and leaves are made of silk. *Materials may vary depending on each design. This hair clip is a custom made. It will take approximately 2-3 weeks to manufacture from the time of the order. Pink & Orange 3 Plumeria 7.25"
White & Pink 3 Plumeria 7.25"